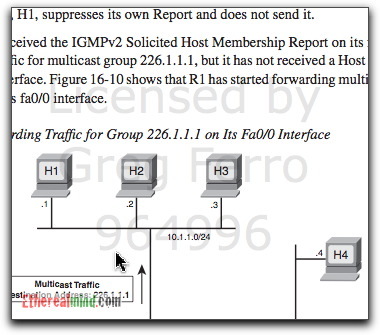 You are here: Home / Blog / Cisco Press Textbooks – PDF, DRM Free and usable on the iPad, Kindle etc. 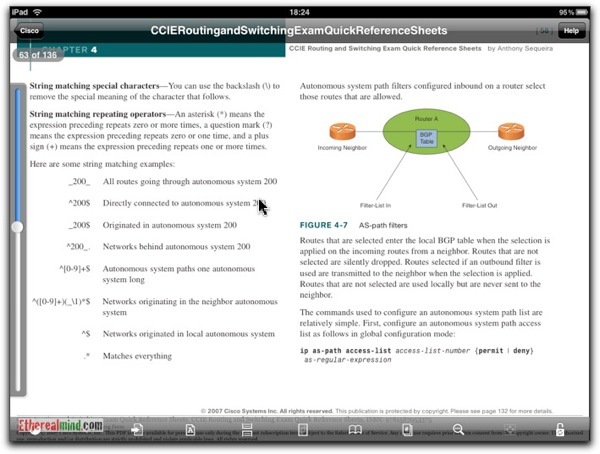 Cisco Press Textbooks – PDF, DRM Free and usable on the iPad, Kindle etc. Cisco Press does sell PDF versions of the Cisco Press textbooks from their website at ciscopress.com but they are all protected with Adobe DRM. Cisco Press is published by Pearson Corporation who is one of the big five publishers who believe that all their customers are potential criminals and should not be allowed to use their product without preventing access to it. And we are rewarded with books in PDF format that are “protected” by Adobe DRM. It’s not that DRM is crap, its that the software which unlocks the DRM is crap. Anyone who has used the IP Expert study materials or any version of the Adobe Reader with the DRM enabled, can tell you how absolutely crap the software is. On Windows the software crashes regularly. On MAC OSX it runs slow and crashes even more often. So, the DRM solution is crap, and comes from Adobe who is a company with a reputation for poor quality software such as Flash and Acrobat Reader – need I say more. So my recommendation is NEVER buy anything that has Adobe DRM on it because you will be unhappy from day one. Therefore, don’t buy Cisco Press textbooks from the Cisco Press website. The Good News – There is a Better Way. And the occasional page is marked with a gray watermark in the back. This means that I can use Preview on my MAC, and Good Reader or iBooks on my iPad to read the textbooks. Note that this PDF version can be used on ANY computer, and any device that you might use in the future (the iPad might not be here forever) since the PDF format is just about universal format for reading fixed format. You should note that this is not available from OReilly website. You must be a Safari subscriber to get access to this. Thanks for sharing this. I was a bit frustrated when I found out CP books couldn’t be used on my iPad (and I didn’t even try to use them on my ubuntu machine). I converted my account to Library last week, and it’s wonderful. Not only do you get access to all Cisco Press books, but you get access to all sorts of books including Microsoft Press, OReilly, A-Press and many many more. I ran into this issue and solved it with an inept python script…. The trouble and hassle was not worth it, never again will I get adobe drm stuff. 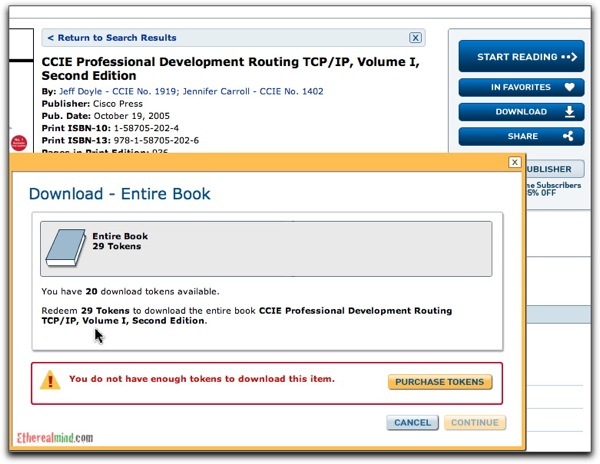 Thanks for the post on where to purchase the cisco press books drm free. Too bad the tokens cost so much to buy extra. I think some of my desire for PDF copies will be met by the Safari iPad App. It’ll at least help. Here’s hoping. But I also note that Safari works much better in the iPad web browser so you could probably almost make do with that, especially in HTML mode as the fonts are beautiful and clear, and makes for good reading. It’s not as a good as GoodReader or iBooks, but its close. Don’t like the Kindle, or the idea behind it. By locking my content into the Kindle platform, I cannot use it where I WANT to, only where Amazon wants me to and where they make the Kindle application. The Kindle app does have poor quality font rendering in many cases and the same problems as Adobe DRM. That’s true for certain publishers, however OReilly does not sell Cisco Press books this way. Like I said, Pearson doesn’t want to let you use the textbooks, they want to PREVENT you from having them everywhere. Only the Safari Subscription sells them in PDF format. And ONLY in PDF format. I’ve been waiting for this post, thanks Greg. This is a tough one. Safari tokens are $2 a piece and per your screen above that’s $58 for Doyle’s Bible. The Amazon Kindle version is $29. Yes, I’m locked into Amazon’s DRM, but is being DRM free worth the additional $29? In most cases, I argue yes. Some books, like the above, are nearly timeless. 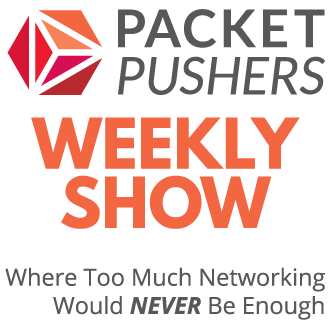 Others are frequently rendered obsolete – I’ve tossed lots of old MS books and I have some VMware books on the shelf that are past their usefulness. So, I’m Kindling. Yes, with Kindle books I don’t really own the book. But for some titles, they might as well have expiration dates printed on the cover. I’m willing to concede that in those cases I’m merely renting them for an extended period and doing so for less than the dead-tree and Safari token versions. I can read it on all the platforms that matter to me and can do so without the process being overly burdensome. I can see your point, but then you are stuck with Kindle app. Now the Kindle app isn’t available EVERYWHERE such as the Sony E-Reader, or some other future device not yet made. Plus, Amazon isn’t a nice company to do business with. For me, the ability to have a copy of the book in ALL the places that I want to use it – including Dropbox, iPad, iPhone, Android, etc is worth a few extra dollars. Also, thanks Greg for first introducing me to this service but I stumbled upon a really good offer just as I was about to click your affiliate link. Safari Library for $30USD for first 12 months (instead of $42USD). Hope you don’t mind me sharing this link here – http://www.safaribooksonline.com/oreilly/skills2/?cid=201008-orm-safari-skills2store – If you have a paypal account, email me details and I’ll make a donation to your school fund. I have just tried out the mobile service from my Android phone (Samsung SGS), and it’s perfectly acceptable. Not suitable for study, so not entirely sure how you would use it, but small diagrams and tables seem to be fairly well optimised. I am going to use my Safari subscription for mainly for Cisco Certification purposes – though due to nature of these publications I’m less keen on buying PDF versions which will soon be out of date. So is HTML service via an iPad terrible for study? I am tempted to buy one anyway, as I can see many complimetnary uses for it, such as Mental Case you wrote about before. I would say that the HTML version is good enough for most people. However because I travel a bit, or have poor access to Internet ( data plans with low data caps ) or have too much history with books I prefer the PDF version. Also, I can afford to pay so my view is a bit different. I don’t buy all the text books, just the ones I use most. 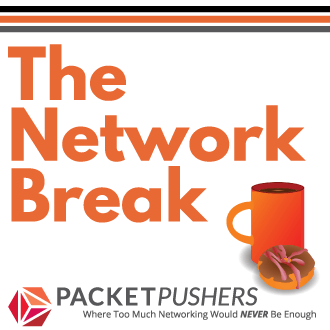 CCIE Recertification, TCP/IP Vol1 & 2 and so on. The other I access using the HTML interface.